The University of Arkansas recorded its best year for research expenditures in Fiscal Year 2018, but its long-term goal is to receive and spend far more in future years. 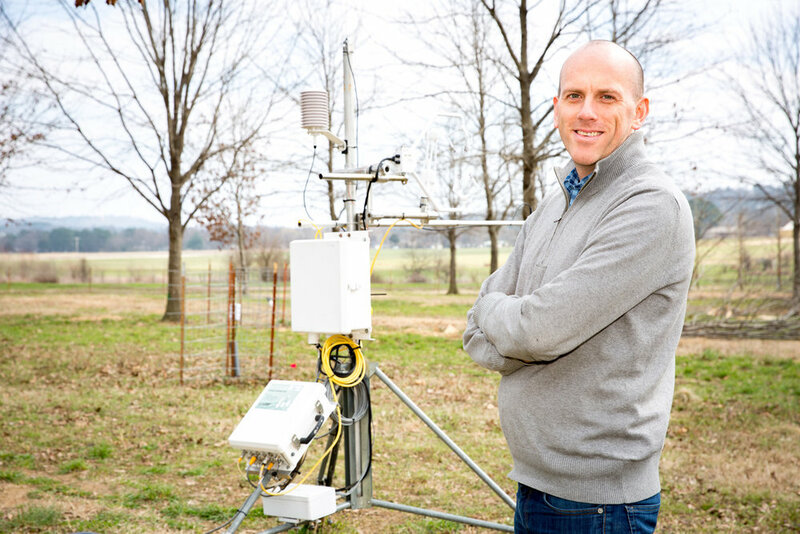 Ben Runkle, an assistant professor of biological and agricultural engineering at the University of Arkansas, is studying how to reduce the environmental impact of growing rice, one of the world’s most produced foods. He received a National Science Foundation CAREER award. The FY 2018 spending of $175 million, which included research expenditures from the University of Arkansas System’s Division of Agriculture, increased by 11 percent over the previous year. It increased nearly 52 percent in the past decade. "This is a reflection of the dynamic growth of collaborative research being done to improve the lives of Arkansans and build a better world through lifesaving discoveries, innovative technology, creative endeavors and economic development,” said Daniel Sui, the university’s vice chancellor for research and innovation. “I look forward to future developments, as our university community builds on this momentum, continuing to implement our strategic plan and strengthen our key research areas." Among the new highest priorities in the Greater Northwest Arkansas Development Strategy, a plan unveiled in July by the Northwest Arkansas council, is to work with regional businesses, governments and the University of Arkansas to double the amount of research and development expenditures by increasing federal, state and industry-sponsored research. The university can go far beyond the $175 million, Sui said. University of Arkansas research spending can lead to the creation of new companies in the state. According to the Association of University Technology Managers, U.S. universities spun off 5,000 startups between 1980 and 2014. That created 3.8 million jobs. The connection between universities and companies that were established in campus settings is a proven model for success. There are updates, videos and stories about university research kept at the Research Frontiers website, which is maintained by the University of Arkansas. $17.9 million from the National Science Foundation for a list of research topics, including wastewater treatment, civil engineering, surface engineering, rice production, power electronics, STEM education and anthropological imaging. $3.1 million from the National Institutes of Health (NIH) for research focusing on topics including wound healing, metabolism, drug design and delivery, DNA sequencing and obesity. Sui said there are opportunities to expand funding in areas such as with the U.S. Department of Defense. “The U of A has made progress in increasing DoD-funded research in recent years,” he said. “We plan to continue to expand our defense-related research efforts by partnering with some of the key players in DoD funding, and already have begun formally establishing these cooperative efforts. Pictured at the top: Michelle Bernhardt-Barry, an assistant professor of civil engineering at the University of Arkansas, received a $500,000 Faculty Early Career Development award from the National Science Foundation to expand her research on the use of soil as a 3D-printed building material.